This photo was taken during the peaceful transition between night and early morning. 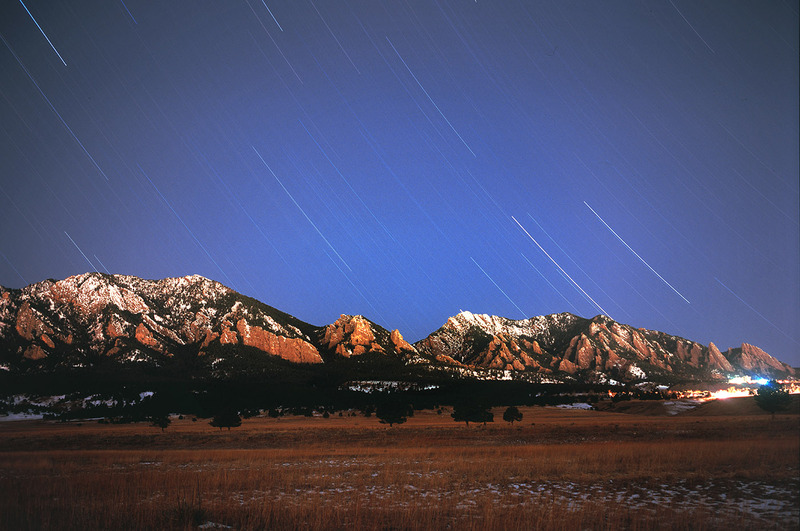 The distant glow of Boulder and NCAR can be seen while the brilliant stars of Gemini and Saturn descend behind the flatirons. During this exposure my Pentax shutter was locked open for almost an hour and I could hear the cries from a pack of coyotes near the South Boulder Creek. The Boulder Flatirons, along with many other distinctive Colorado landmarks, were formed during the Laramid mountain building event. This event started in the late Cretaceous period 65 million years ago and continued through much of the Tertiary period. This Laramid mountain building event caused much of the folding and faulting we see in Boulder, Lyons, and Fort Collins. The flatirons include a resistant rock layer that has been turned up at an angle to look like the bottom of a hand iron.